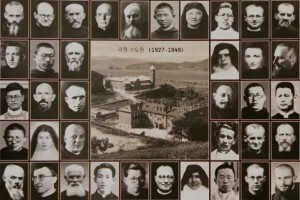 Monks and nuns are prime candidates in being martyrs for the Catholic Faith. Today, the Benedictine Congregation of St Ottilien (a missionary group of missionary monks) collectively honor those who shed their blood for Christ between the years of 1889 and 1954. Laying down one’s own life by accepting death bears witness to faith in Jesus Christ and His Church. 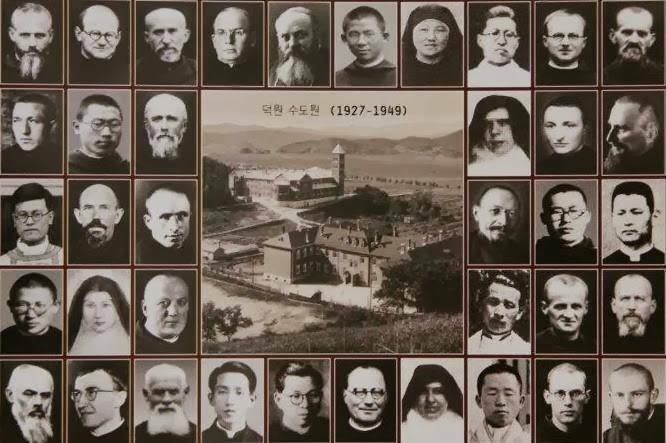 Many of these monks died in Asia and Africa. 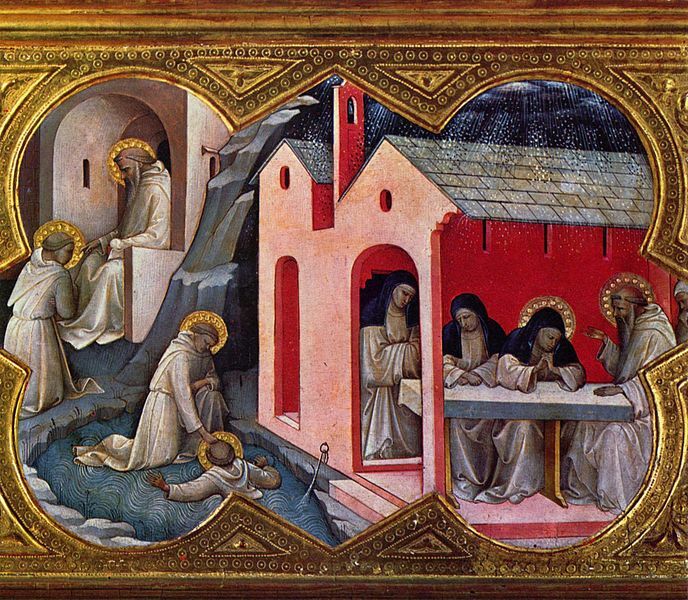 What does the miraculous gesture of Saint Benedict show us? The raising of Placidus challenges what we typically believe about truth and reality and our disordered desire to be constantly in control. Benedict tells us that we are not in control –only God is. The ordering of our human desires requires us to be in alignment with God’s Holy Will. This episode also illustrates Benedict’s point in the monastic tradition and spoken of in the Rule of mutual obedience –the listening to each other and the following the lead of the superior. On one level mutual obedience teaches a fraternal reliance on one another; on a higher level, mutual obedience is a distinct form of listening to the Holy Spirit. The Spirit is manifests Himself in the discerning and holy activity of people who have their hearts and minds attuned to God’s Voice. Until I read somewhere else today, I never heard of Blessed Jutta of Disibodenberg (c. 1084-1136), a German noble woman, an anchoress, and the teacher of children, especially Saint Hildegaard of Bingen. Blessed Jutta’s history says that taught female students from wealthy families at her hermitage. She taught and raised them all, most notably the child Hildegard of Bingen. Jutta was known for her sanctity and her life of extraordinary penance; Justta was known as a healer. On the Day of All Saints, November 1, 1112, Hildegard was given over as a Benedictine oblate into the care of Jutta. It was Jutta who taught Hildegard to write; to read the psalms used in the Liturgy; to chant the recitation of the Canonical hours. She probably also taught Hildegard to play the zither-like string instrument called the psaltery. Saint Hildegaard of Bingen, succeeded Jutta as abbess; Benedict XVI named Hildegard a Doctor of the Church and we would make the claim that she owes her fundamental knowledge of life to Blessed Jutta. Let us pray for those who were our first teachers of life and faith. We have a new Benedictine oblate Blessed! 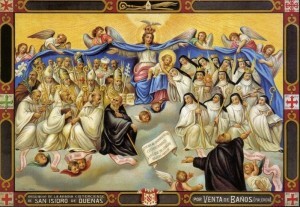 Today, Pope Francis and the Congregation of Saints approved of the miracle attributed to the intercession of the Venerable Servant of God Itala Mela. The new Blessed was a Benedictine Oblate of the Abbey of Saint Paul outside the Walls (Rome). 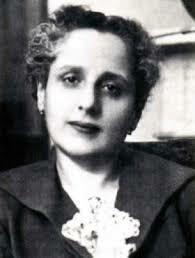 She was in La Spezia (Italy) on 28 August 1904 and died on 29 April 1957. Itala also went by the name of Sister Maria of the Trinity. Mela’s particular mission was to make the Holy Trinity known and loved. Dom Aldo Piccinelli, OSB, wrote a book on Mela’s teaching, The Spiritual Experience of Itala Mela: A life incandescently immersed in the Trinity (2015). Thanks be to God for the gift of new Blessed from among the Benedictine Oblates! 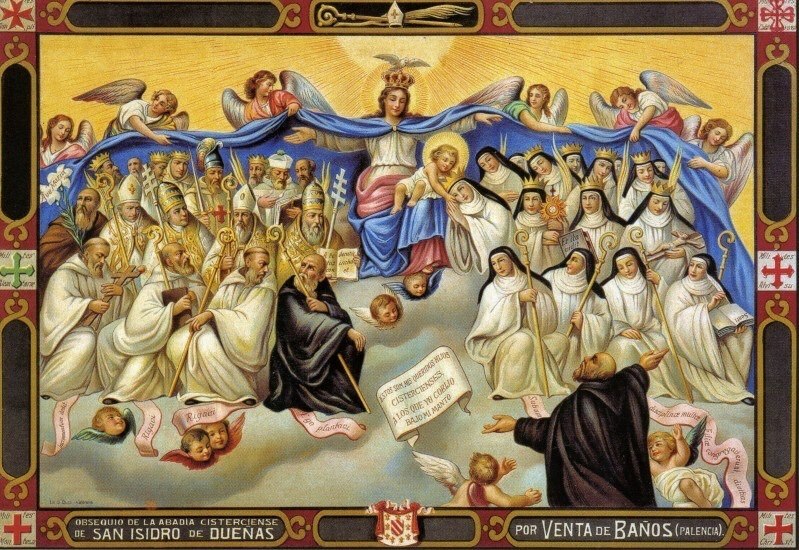 We of the Benedictine family traditionally celebrate the feast of All Saints of the Benedictine Order — In Festo Omnium Sanctorum Ordinis S.P.N. Benedicti. 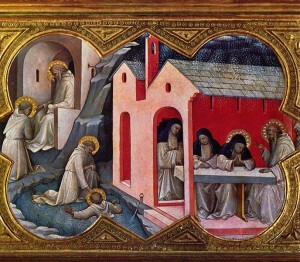 The Cistercians –who likewise follow the Rule of St. Benedict, observe this day for All Saints of their Order. may persevere in daily seeking the face of God; thus giving the Holy Trinity praise day and night. Against the raging hordes of hell. With all low pleasures of this earth. The simple fare whereon ye fed. And on the hard ground was your bed. And fiercest monsters harboured near. You saw, but would not yield to fear. Of angels in the heavenly height. To Thee be praise and glory paid. ~text found in the Breviaries Monasticum until 1963, and in the Breviaries Cisterciense.